God, I love the thought of the suppressed minions of Amazon, probably Bangladeshi orphans, no doubt dressed in drab uniforms, doggedly sifting the net for social media postings, poring through stultifying virtual reams of mindless drivel on a quest to find a bias in a review of a never-to-be-read-by-anyone tome. Let it be true, please. Having worked for Amazon in the past, I can tell you that this was almost surely read by an American customer service agent, probably sitting right in Seattle, and that they verified the link with their own eyes, cross-checking the automated system and confirming you could be on a first name basis with the author. It’s my guess that you live in the same town as the author. I doubt I can be of any further assistance as I did not work in that department and don’t know anything about how that department operates. I recently wrote a review of A Walk in the Woods… . It was rejected. I edited it, taking out the words “niggardly” and “dumbass”. It was published. The last word is certainly not obscenity but the former word, well, sounds fishy to someone with a sixth grade vocabulary. I think it’s a robot. I’m torn. If someone is a reviewer, it seems wrong to hinder their ability to do their work, and you can’t be expected not to “know” authors. Also, does it stand to reason that paid reviews are better? Those reviewers don’t know the author, but they are being paid for glowing reviews, a practice I hate. I will give free books for review, but I won’t pay for one. I don’t know. There has to be a better way than this, and some of the books I see with five stars 100 times over… do not get me started. Is there really a such thing as an “unbiased” review? Of course this is total BS and I hate censorship. Would they have felt the same if your review was a 1-star? I am shocked and appalled. I have relied heavily on Amazon reciews for peoduct comsiderations but never thought that some of the reviews could be silenced like that. Makes me want to shop less at Amazon. Thank you for putting this out there. I’ve had reviews removed too and not from people who live anywhere near me. The ‘could be on a first name basis with’ is just too ridiculous and vague to be a business practice, surely. I am on a first name basis with some famous authors that I’ve never met, because they interact with their followers on social media. Authors use their personal Facebook pages as business networking tools. It doesn’t mean we are personal friends with these people. I’m not about to invite them over for dinner or introduce them to my family. To me it’s clear that Amazon is using Facebook connections to make this decision. Hell, if they look at Twitter hundred of people who sell 10,000 Tweets won’t be able to review my book. I can understand family links, but this is ridiculous. I pay for books and leave honest reviews, no matter who the author is. This whole situation just makes me SO MAD! 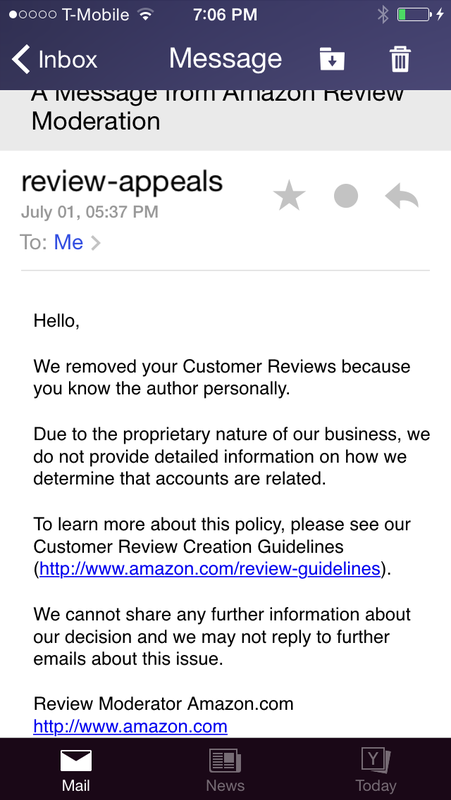 Amazon is removing reviews of my books without any — not even slightest – indication that these come from people known to me. Or living nearby – much less family which I don’t have – not in North America, anyway. They have removed reviews by total strangers who bought my books and when I ’emailed’ their review-tribunal whatever it is, I received an automated reply that was even more inane than the ones I read about here. It stated that I should contact the reviewers whose reviews were removed and ask them to appeal. Are they serious? Can’t someone out there put this kind of stupidity to rest? The reviews were from total strangers. I do not have their emails, have no knowledge of their residence or anything else other than they bought my book because my sales numbers support it. I do not have their names and if anything it’s Amazon who would have their emails and their usernames. This practice has long passed the ‘annoyance’ stage and has firmly landed in the criminal moat. Since no one seems to be able to do anything about these robo-trolls and asinine algorithms, my books will be leaving Amazon as soon as their KDP enrollment is over. Will I miss them? Kind of doubt it. I’ll have a new e-commerce website and Kindle versions can come off there. Whereas epubs and hardcopies will come from other distributors who at the very least aren’t as criminally stupid as Amazon. They might seem to think they’re an empire but history shows that empires topple…sooner or later. Hi, I have seen the link to this story on Twitter a few minutes ago (yes, only today, it is the magical logic of social networks…), and I have two comments. First one is specific: I have myself commented on several books on Amazon, and especially about two books written by someone I know personally, living in my neighborhood, with kids in the same school, connected with me on social networks, etc. I have bought the books, my wife has read them (they are about nutrition…), she has written two 5-star reviews, and I have published them (and my friend has thanked me, using my surname…). On Amazon. I have never been rejected or suspected of any friendship link. So the process is bogus somehow. Second one is more technical: if Amazon uses some machine learning and data mining tools to help them find “irrelevant” reviews, then a statistical fact must be considered, e.g. the more comments you publish, the more likely you are to fall into that trap, as the algorithm will be in a better position to find some links, as there will be more data… This is a paradox of Big Data, the more data, the easier to find a correlation. And there is the trap: correlation does not mean causation, the fact that you have many traits in common with an author does not mean you know him, it only means you have a fair amount of things in common, enough for a machine to trigger a warning about a suspicion. The issue with the Amazon review team is that they have not made the difference, most probably because they do not add their personal judgement to the machine processing… This is the reason why I have not been spotted, because I have not written enough reviews to help Amazon’s algorithm to detect my own behavior. Conclusion: writing reviews on Amazon is only permitted to occasional random reviewers, who will never be spotted by the Review Assessment team, because there is no pattern, even if they write non-sense. Writing numerous and systematical reviews will trigger such issues as you have described, one day or another, even if your reviews are of the highest quality. The process is as stupid as a machine, that’s all folks. Your story was really interesting to me because yesterday I read a review of an e-book that started out “I am a personal friend of this author and I really liked this book…..” The reviewer gave it 5 stars. I left a comment saying that’s probably why she gave her 5 stars. I wish I could remember which book it was. There are exceptions to the rule, of course. But then again, you have to ask yourself, does it matter if they are friends with the author? Sure it does breach that fine line of objectivity, but what if it was really a good book? It’s tough to say. This is extremely upsetting. It hasn’t happened to me yet, but I’m still furious. If someone buys a book, they should be able to review that book. Period. I personally don’t like the thought of authors reviewing other authors, especially if they write in the same genre. I know some authors that use fake names and leave bad reviews for their contemporaries. You should be blaming them, not Amazon. They’re the ones who spoiled it for us all.